​​​We are Courtney and Adam Webster, a husband and wife duo who love growing things and the whole farming lifestyle. We do all the growing, processing, delivering, marketing, and everything else in between! We feel fortunate to be able to grow all our produce on our family's land in the beautiful Annapolis valley, continuing a third generation of farming on this land! Adam has always had an interest in the outdoors and in sustainability. Around the farm he works in the fields, weeding and keeping the plants happy and healthy. 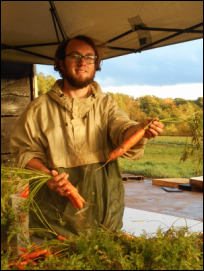 He also picks produce, washes it and delivers the CSA shares to the HRM, as well as sells it at the Wolfville Farmers Market. Adam has high hopes that the future will bring more and more small farms, the local movement will continue to flourish and more natural places will be sustained through respecting the soil and the health of the environment. Aside from farming, he is an avid writer and is currently writing a collection of poetry. Courtney arrived in Nova Scotia from Florida in 2010 after following her true love Adam back to where he grew up. Since then she has earned a degree in horticulture at Kingstec College in Kentville, and her and Adam tied the knot on the farm in 2013. Around the farm she starts transplants in the green houses and is constantly researching eco-friendly ways to stabilize pests in the field. Courtney plans out the season and coordinates the deliveries. She is also an avid photographer which she went to Daytona State College for in 2007-2009; most of the photos you see on the website were taken by her. She also sells her more artistic photos at galleries in the valley as well as online.